Darshan: This is one of the single, most powerful blessings bestowed upon an individual, as it is a rare opportunity--by way of the gaze or touch from a God-realized being--to directly receive the living essence of God's love which dwells in the consciousness and embodiment of the Master. Education: Through the study of Louix’s teachings, by practicing his recommended daily spiritual tools for growth and transformation, and by participating in his educational programs, ones can achieve self-mastery and true inner peace and joy. Humanitarian Service: Recognizing the interconnectedness of humanity and the importance of helping others, the Louix Dor Dempriey Foundation offers loving service to individuals and groups worldwide, as well as to the earth and its environments. become consumed by the flame of his love. Louix's darshan is available to people of all faiths, beliefs, and walks of life--for his love is truly unconditional and embraces all. The Grace of the Master has profound transformational and healing effects, often evoking exalted states of bliss, spiritual awakening, and even, at times, healing of physical ailments. For thousands of years, people have come before God-realized beings to receive this immense blessing which, by its own nature, augments and strengthens one's spiritual or religious beliefs. one more part of your inherent divinity. As a result of being in his presence and by practicing his teachings, thousands of people of all faiths and cultural backgrounds have experienced life-changing transformations. Louix and his teachings are available through myriad public programs—spiritual retreats and pilgrimages, meditations, study groups, and other special events—as well as through a host of educational products, and via the online community and library of his teachings. Attending pilgrimages, retreats, and public audiences are ways people can receive Louix's darshan (blessing) and be illuminated by his wisdom. During these events, Louix gives discourses on various aspects of self-mastery and Enlightenment, and facilitates Q&A sessions, sacred ceremonies, and meditations. 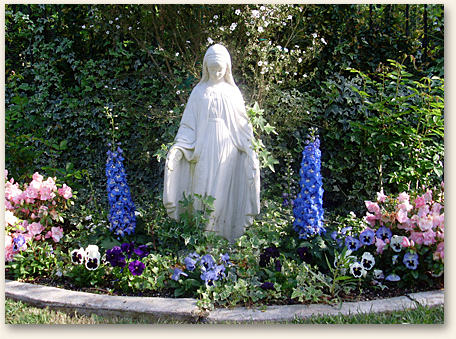 Being in his presence and participating in these events helps people become aware of and heal the wounds and patterns which prevent them from living as unconditional love. In previous years, Louix has led sacred pilgrimages to Sedona, Maui, Mt. Shasta, Central Australia, Egypt, Israel, Kenya, and India. In addition, he has held several retreats (as well as many private and public audiences) in the United States, Canada, Australia, Japan, and New Zealand. In 2007 and 2008, retreats were held in Australia and the United States. The Foundation will continue this tradition of coordinating pilgrimages to sacred and historical sites, and bringing retreats and other public programs to countries all over the world. Youth Groups (for pre-adolescents and adolescents) have been held to assist children in establishing a spiritual foundation in their lives. 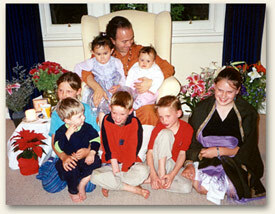 The children are taught basic meditation techniques, prayers, devotional singing, and other tools (including the use of educational films and other media) to foster and develop their intuitive talents and abilities, to strengthen and restore their full connection to the Divine realm, and to nurture their overall spiritual, mental, emotional, and physical well-being. The children are involved in community service activities (spending time in/with various groups, communities, cultures, and organizations) and are taught to love, appreciate, protect, and preserve nature and the environment. Study Groups offer a regular forum for people to explore Louix’s teachings and to learn about the many practical tools he offers to accelerate one’s spiritual development and to experience greater joy and inner peace. They are facilitated by His disciples, devotees, and others who have been deeply impacted by his presence in their lives. Study Groups are currently established in the United States, Canada, Australia, and New Zealand. One of the goals of the Foundation will be to create study guides and other materials to facilitate the study of Louix’s teachings by individuals and groups. The Foundation also plans to set up study groups in schools, universities, prisons, church groups, and other institutions that serve the greater community. These intimate gatherings held at Louix's various ashrams and centers provide a safe environment for the attendees to share with an open heart and to deepen their bonds of sisterhood and brotherhood. They also provide the opportunity for both the group leaders and all participants to share their experience and wisdom with each other, growing and learning from this interaction. Louix has a diverse and extensive background in the creative arts. He is passionate about celebrating the diversity of cultures, the richness of their art, and the aesthetic and ancient traditions of the past and present. While the Foundation does not have any specific creative arts programs currently in place, it is an area that will be expanded in the future. Living in community, residents support one another’s spiritual growth and attainment of self-mastery and God-realization. 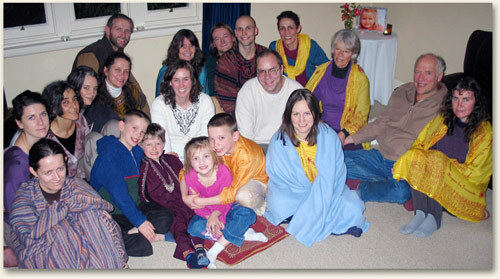 They take part in daily meditations and prayers, service, and scheduled gatherings and activities. The depth of love and safety in these closely-knit and loving communities facilitates profound growth and healing for all who live there. 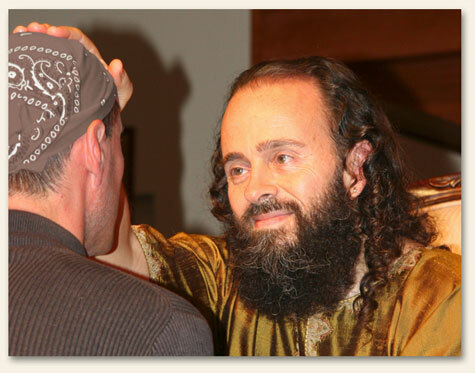 The ashrams host public meditation evenings, study groups, pranayama (sacred breathing technique), and open house gatherings, offering people the opportunity to receive the blessings of Louix’s life and teachings and to share those blessings with others in the greater community. Sundara Aravinda in Melbourne, Australia. 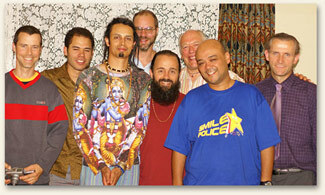 One of the goals of the Foundation is to develop more ashrams under Louix’s guidance. The communities established in rural settings will ultimately be fully self-sustaining for both food and energy (i.e. “off-the-grid”). They will grow extensive organic gardens and orchards, and will use solar and other natural sustainable energy resources that foster and perpetuate Louix’s teachings on the importance of “green” living. All of Louix’s ashrams strive towards vegan2 living. 1Ashrams are intentional spiritual communities formed primarily for the enrichment of those who choose to live within them. They are traditionally formed and centered around the life and teachings of a living Master (God-realized being) and serve to help spread those teachings. 2Merriam-Webster dictionary defines a vegan as a strict vegetarian who consumes no animal food or dairy products; also one who abstains from using animal products (such as leather and fur). In 2008, the Foundation published a book entitled The Heart Always Knows, a collection of 59 essays written by Louix’s disciples and devotees, several of whom are in the midst of writing their own books about their walk with him. Louix also has several books and other literary works currently in development (including a re-write of his first book, Dawn of Enlightenment, self-published in 1998). Since his ministry began in 1996, Louix has produced an extensive library of audio and written products, as well as recordings of his many events, courses, retreats, and pilgrimages, all of which are compilations of his ageless teachings on self-mastery, Enlightenment, and unconditional love. Also, this website (formerly www.LouixDorDempriey.com) comprises an extensive portfolio of His teachings, including discourses (audio, video, and written), stories, poetry, photos, book excerpts, and Q&A’s--and is continually being updated and expanded. Louix's teachings have been published in magazines throughout the United States, Canada, Australia, New Zealand, and India. He has appeared and been interviewed on various radio and television programs in the United States, New Zealand, and Australia. There are plans to produce various documentary films about Louix’s life and his teachings (with one that is currently in production), and to expand his presence in print publications and in all media throughout the world. There is an ever-expanding library of audio and video recordings of Louix’s life and teachings, as well as his personal artifacts, that are in the ongoing process of being archived. Currently, the recordings of Louix’s discourses are transcribed by volunteers around the world. Once transcribed and cataloged, these recordings provide the raw materials to create published works including books, study guides, articles, films, and audio books. There is an urgent need to preserve the many audio and video tapes that are now more than a decade old. Many are beginning to deteriorate and could be erased or permanently damaged. With the increased human and financial resources that will come through this Foundation, this very important work will be given the vital attention it needs. 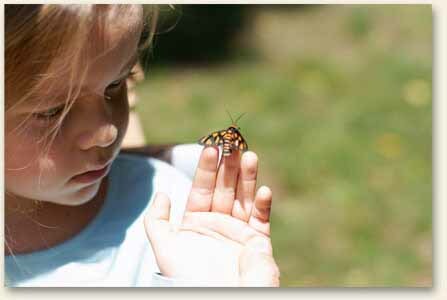 Compassionate hearts change the world. 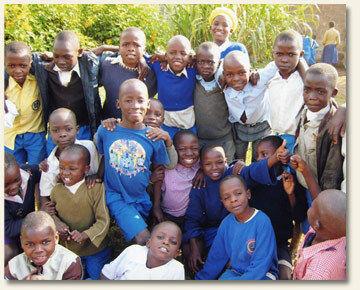 The Foundation also regularly participates in local community service programs. Louix’s extended family of devotees, friends, and affiliates also volunteer to their local communities and organizations on a regular basis. Activities include visiting senior citizen homes, house cleaning, feeding and caring for the homeless, clothing and food drives, serving hospices and their residents, and socializing with at-risk youth. The Foundation’s global service projects come under the umbrella of Grace in Action, which is currently comprised of two initiatives: Global Clean-up Project and Forests of Fruit. Both of these programs welcome and encourage public participation. Global Clean-up Project (picking up trash in communities worldwide, as part of our dedication to making the planet a cleaner, more beautiful place to live). Global Clean-up Project was established in December 2003. Its goal is to clean the Earth by picking up trash in our communities and disposing of it responsibly. To date, the equivalent of more than 16,000 grocery bags of trash have been collected by volunteers in six countries. 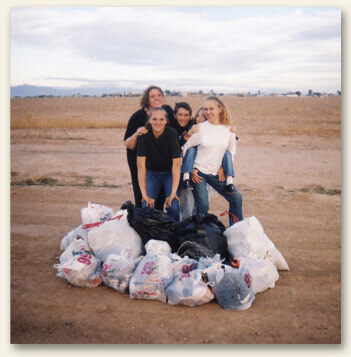 Louix’s ashrams and study groups coordinate regular community trash pick-ups and support their local city council’s community events on special occasions such as Earth Day and International Waterways Day. Forests of Fruit (planting fruit trees everywhere, for the three-fold purpose of reforesting the planet, reducing global warming, and eradicating world hunger). Forests of Fruit was initiated in December 2005. By planting fruit trees on various public and private properties, and encouraging others to do so, this project gives life to Louix’s teachings of how fruit is paramount to our health and vitality. This project’s goal is to bring an end to starvation and malnutrition (which claim millions of lives every year) by providing free, naturally-grown food for all human beings (and animals and birds) everywhere. It also serves to reforest and oxygenate the planet (thus reversing the effects of global warming), and to beautify the world while so doing. In the future, Grace in Action will include additional projects that embody Louix’s teachings of living in grace and harmony with Mother Earth and with all living beings. These programs are all currently coordinated by volunteers. As resources become available, the current and new programs will expand to include community education programs, greater local and international publicity, and coordination with other like-minded organizations. The Foundation intends to also create many more service and humanitarian projects that will serve the physical and social needs of all sections of society. All the programs described above are currently managed, facilitated, and supported by a small, dedicated group of volunteers. The establishment of this Foundation creates the vehicle for increasing its volunteer base, employing full- and part-time salaried staff, and expanding its activities to reach a wider international community.